Eggs make frequent but unspectacular appearances on this blog. Like dead metaphors–staples of language we barely notice–eggs are ubiquitous, humble, and very nearly necessary. Aside from windowsill herbs, eggs are probably the easiest foods to find locally. In every little region, you’ll find someone who keeps a backyard flock of laying hens. Just ask around. We eat eggs often, and of course not just for breakfast. Like dairy products, eggs are nearly perfect foods, offering a healthy dose of fats and protein in neatly portioned packages. They are also relatively cheap, when compared to other sources of animal protein. And to top it off, they cook in minutes. 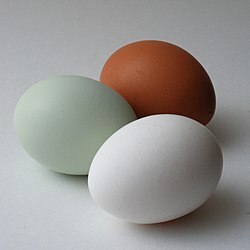 Find fresh, local eggs whenever you can; the difference in taste and quality is huge. The easiest, and no less delicious, way to cook an egg is to scramble it with some salt and pepper, heat a pan on high, melt a bit of butter, pour in the egg, turn off the heat, move it around a bit, slide it onto a plate, and eat. Lunch in our house is often a changing combination of vegetables alongside an 8-minute egg. Jack loves eggs in all forms, which gives us an easy dinner option when he refuses the bluefish or something “smelly” like that. (Though he did eat bluefish “pate” with relish the other day, when he thought it was just some salty spread.) Fritatta is an easy dinner we have frequently. Anything can be thrown in–from last night’s steamed broccoli to a bit of frozen bacon or a handful of fresh herbs. One of the best, and simplest, fritattas I’ve had was made by a friend of a friend of the family’s whose apartment we were staying in for a night in Paris. Peter and I were on a post-college trip, crashing for free when possible. These friends of friends, whom we’d only just met that weekend, invited us to stay with them on the night before our early flight home. They had a two-year-old daughter, Chloe, who had to be fed and put to bed before dinner. They’d just arrived back home on a Sunday evening after a weekend at their parents’ in a suburb of Bordeaux. It had been a long day, and a quick meal was in order. The meal Valerie cooked up was a fritatta made with whole sage leaves spread in a six-pointed circle. The eggy texture was perfect–set but still moist in the middle. There was also a bit of salad and baguette. Perfectly simple. Preheat oven to 350. Whisk eggs with salt and pepper until foamy. Heat an oven-proof skillet over moderately high heat, and melt a bit of butter, spreading it evenly and thinly over the whole pan. Pour in the eggs and cook until it starts to bubble and form a skin on the bottom. Lay in the sage leaves. Pop it in the oven for about 10 minutes or until set. When set, invert onto a serving plate, slice, and serve. Or, introduce and endless variety of other ingredients….